Are you a fan of Sherlock, British mysteries, or paranormal reads? Well, you have hit the jackpot with the new Stoker and Holmes series. I absolutely adored this novel! 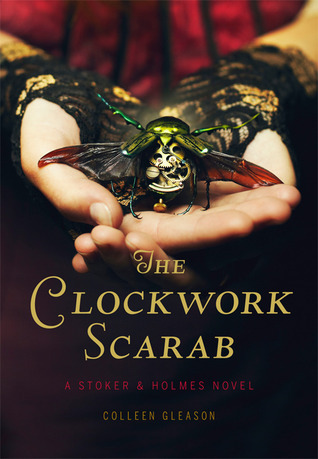 The Clockwork Scarab has amazing characters, an awesome plot, hints of romance, paranormal aspects, danger, and humor. Mina definitely proves herself worthy to call herself Sherlock's niece. Her observation skill and knowledge are most admirable. Evaline was equally as awesome. She is super strong, popular in London society, and over all kickbutt... although she does have a problem with blood. One of my favorite scenes is when she goes to a pub and establishes dominance over Pix in an arm wrestling match. Pix is an awesome character who I loved!!! Other great male characters included Inspector Grayling and a really sweet time traveler. Personally, I am rooting for Mina to end up with Grayling. Both guys are awesome but he is a much better match for her! The plot was great too! There is a mysterious, scary villain, Egyptian goddesses, scarabs, time travel, and, of course, murder. And the mystery starts with a task set from no one other than Irene Addler! Although the plot was full of danger and life-or-death situations, the author still managed to incorporate witty lines that made me laugh! Overall, The Clockwork Scarab is definitely a new favorite. I cannot wait for the next book!